These two chips provide an easy way to control either an array of 64 Led's or up to eight digits made of 7-segment displays with a minimum of electronic components. Besides the chip itself you will need only a single resistor and one or two capacitors. 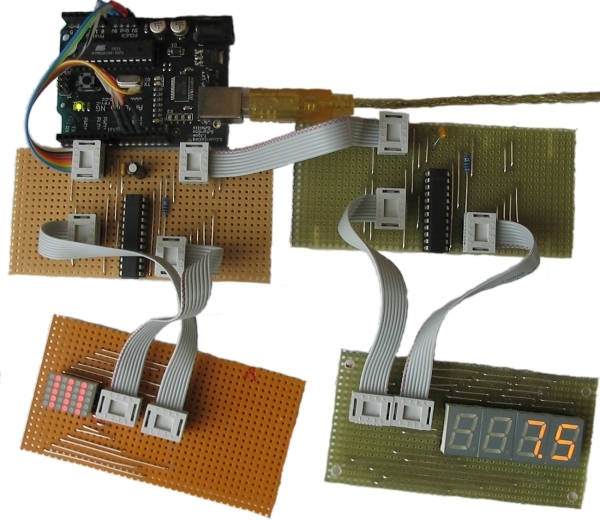 Data is send to the chip using a SPI-compatible protocol using 3 of the digital pins on the arduino. If you want control more than eight 7-segment displays (or more than 64 Led's) the chips can be cascaded. The library supports up to 8 cascaded devices, which add up to 512 Led's that can be lit individually. The good news is that you still need only 3 pins on your arduino board. Here is a picture of my rather crappy (but working) testbed... If you wonder wether the MAX7221 or the MAX7219 is more suitable for your project ... just go for the cheaper one. But, if there is a chance you'll switch from the arduino to a different controler hardware, use the (more expensive) MAX7221. This one implements a fully SPI compatible interface. The LedControl library can cope with both types of devices, and the visual appearance to the user is the same. This is not the first time someone puts out code for the arduino and the MAX7221, but the focus has usually been on controling Led's layed out in some kind of rectangular matrix. I mainly use the chips to drive 7-segment displays, so I obviously want a function to display numbers (decimal and hexa-decimal) and also the limited set of alphanumeric characters that make (visual) sense for these types of displays. I also wanted the code to be useful for a bigger audience, so there had to be a set of functions to switch individual or groups of Led's on and off. If you have used other libraries for the MAX72XX that used the Sprite-library, I have to tell you that the LedControl-library does not support Sprites, mainly because the library uses too much memeory on the Arduino. Adding the LedControl-library to your code will cost you 1690 bytes on an ATMega168. But this number is for the basic (do-nothing) application, where we only include the library-code without calling any of the functions. If you have been using the Matrix/Sprite-lib you will not be amused to hear this one : The LedControl-lib uses a different scheme of adressing the individual Led's on the hardware Ok, I know that this is annoying, but it should not be difficult to port an existing application with the hints given later on. The reason I use a different hardware-address scheme for the Led's, is that the layout used in the Matrix/Sprite-lib would require some extra bit-twisting code for each change on an Led's state. Since you will have to rewrite all of your code anyway when switching librarys, I decided to put that extra burdon upon you, just to save some more bytes and performance, sorry. Other differences between existing library-code and the LedControl-lib are discussed along with the API-documentation. * Create a new LedControl. The first step is is obvious we have to include the LedControl-library. Then we create an instance of type LedControl to talk to the MAX7221 devices. An LedControl is to be initialized with 4 arguments. The first 3 arguments are the pin-numbers you haved used in the connection between the arduino-board and your (first) MAX72XX. You are free to choose any of the digital IO-pins on the arduino, but some of the pins are used also for serial communication with other devices or have a led attached to them (happens to be on pin 13 of my board). In the example I choose pins 12,11 and 10. But this simply depends on your own hardware setup. The library does not check for the pin-numbers to be valid in any way. Passing in something stupid will break your app. You don't have to set the pins to be used for the devices as outputs or initialize them in any way. The library handles all this for you. Simply hand them over to constructor and then leave them alone for the rest of the code. If you need to control more than 8 MAX72XX, you'll have to create another LedControl-variable that uses 3 other Pins on your arduino-board. // ... and another one, now we control 1024 Leds's from an arduino, not bad! // The second one must use different pins! Obviously two instances of LedControl cannot share the pins on the arduino-board. * Gets the maximum number of devices attached to this LedControl. Please note that the MAX72XX is always in shutdown mode when the arduino is powered up. Starting up in power saving mode is always a good idea for an battery operated application, but you will have to activate every device before use. If you go back to the code-example in section Power saving mode you'll see how this is done inside the setup() function of your application. When a new LedControl is created it will activate all 8 digits on the display of all the devices. So each lit digit will be switched on for 1/8 of a second by the multiplexer that drives the digits. If you have any reason to limit the number of scanned digits, this is what happens : The Led's get switched on more frequently, and therefore will be on for longer periods of time. Setting the scan limit to 4 would mean that a lit Led is now switched on for 1/4 of a second, so the MAX7221 has to provide the current on the segment-driver for a longer period of time. * Set the number of digits (or rows) to be displayed. * Only values between 0 (only 1 digit) and 7 (all digits) are valid. There are three factors that determine the brightness of the display. The first one is the resistor Rset which limits the maximum current through the Led's. The datasheet has a section on selecting a proper value for Rset. If its too small there is a chance the Led's draw more current than the MAX72XX can handle. The second factor to display brightness is the scan limit of the display. From the ScanLimit section you already know that I'd recommend to leave that parameter at its safe default. Lowest intensity does not mean the display isn't lit at all, its simply : dark! The range of values is from 0(dark) to 15(brightest). Every other value will be ignored. * Set the brightness of the display. * int intensity the brightness of the display. *               Only values between 0(darkest) and 15(brightest) are valid. What can be said on this topic once you read the name of the method : LedControl.clearDisplay()? * Switch all Leds on the display off. The picture of my setup at the top of the article reveals that I have only single 5x7 Matrix Led array. With this Matrix I'm not even able to use the full 8x8 Matrix that could be controled with a MAX72XX. But this cheap display is ok for testing the basic concepts the LedControl library provides for a Led matrix. * Set the status for a specific Led. *           Only values between 0 and 7 are valid. It should be obvious what the function does and what the addr and the state arguments stand for. 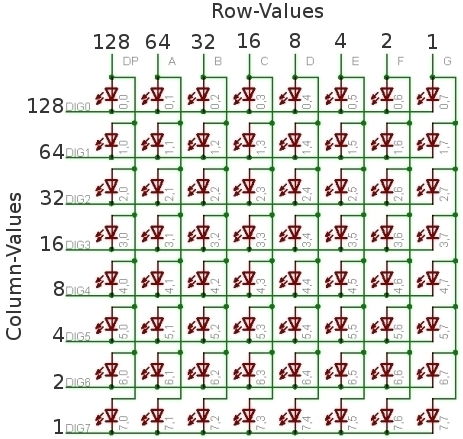 But what is meant by a row and a column on the matrix? As the idea of the Leds layed out in the shape of matrix is a purely theoretical one, here is a schematic that should clarify how the matrix is to be connected to the pins of an MAX72XX. At the top and left side of the picture you see the pins on the MAX72XX, to which the Leds have to be connected. Each of the Led's has its position in the matrix written on the right side. The row and column arguments should now be quite obvious: There are 8 rows (indexed from 0..7) and 8 columns (also indexed from 0..7) in the matrix. If we want to light up for instance the Led which is located at the very right of the 3'rd row from the top, simply take the index from the picture (2.7) and use is as the row and column arguments. In your code you would use lc.setRow(0,2,146) to set this row on the first MAX72XX attached to the arduino. The setRow()-call works also much faster than calling setLed() in turn for each Led. So use this one whereever you can. *            Only values between 0 and 7 are valid. This is going to be much easier than the last section. The picture at the very top of this page already showed what is possible. 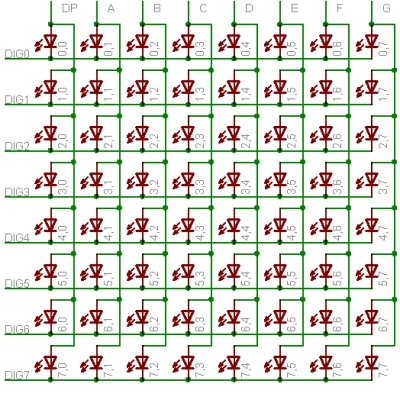 I think there is no need for a schematic here, beause from the datasheet of the MAX72XX it should be quite clear how 7-segment displays are to be wired. * byte value the value to be displayed. *            Only values between 0x00 and 0x0F are valid. * boolean dp If true also switches on the decimal point. The digit-argument can be from the range 0..7 because the MAX72XX can drive up to 8 7-segment displays and the index starts at 0 as usual. Although only a limited set of characters can be shown on a 7-segment display, this is sometimes very handy. The value argument is of type char and can be from the range (numeric)0 to numeric(127). For all these value we have a defined character which is mostly the <SPACE>. But if there is a recognizeable representation for a (ASCII-)character it will be printed to the display. For character values above 127 the <SPACE> character will be printed. For conveniance reasons the hexadecimal characters have also been redefined at the char values 0x00...0x0F. For that reason you can simply pass in a byte instead of a char argument if you want to mix digits and characters on the display. The prototype of the function is almost the same as the one for displaying digits. * Display a character on a 7-Segment display. * The char that can be acutally displayed are obviously quite limited. Ok, that was it ... thanks for listening! You have to unpack the zip-file into the library directory of your arduino environment. The location of the library directory has changed with more recent versions of the arduino environment. Now hit the verify/compile button and the library will be compiled and is then available for all of your sketches that start with a #include "LedControl.h line. When the library gets compiled inn the arduino-ide, some warnings are issued. None of these warnings is relevant for your application code. There is more to come surely! The sourcecode for this library is released under the Terms of the GNU Lesser General Public License version 2.1. This document is ©2007 by Eberhard Fahle. I make no claims as to the completeness or correctness of the information contained in this document. Permission is granted to copy, distribute and/or modify this document under the terms of the GNU Free Documentation License, Version 1.2 or any later version published by the Free Software Foundation; with no Invariant Sections, no Front-Cover Texts, and no Back-Cover Texts.